It is unfair to say that freedom of expression and the media are first under fire from political power in Ecuador. The country has a long history of abuses of the rights of reporting, opinion and dissent. Nowadays politicians use all kind of guerrilla tactics while (ab-)using media outlets. Remember for instance the healthcare debate in the US or consider what FoxNews is doing or look at the Teaparty campaigns. Besides populism, polarization, libeling and false accusations, public opinion remains a very strong weapon in the hands of the opposition for any government. After elections, the game continues in the media with every new government bill, initiative or mistake. Expensive investigative journalism is less attractive today to most newspapers and Radio/TV stations. All too often investigative journalism is interpreted as investigating the Internet. More and more mainstream media seem to be limited for their coverage to news agencies, quotes, rumors, columnists and sensational events and on top of that have to deal with deadlines. Also the public is less prepared to pay for high quality news reports and news analysis. Therefore mainstream media are happy to report on domestic politics in the way they do. These are the tendencies in Western Europe and the US, but in Latin America and especially Ecuador the situation is much, much worse, because polarization as well as temperament is often much stronger and corruption also comes into play. In Ecuador President Rafael Correa seems to have found a way to reverse this trend. He is trying to muzzle the media outlets for some years now quite successfully. After the 2010 coup attempt Correa thinks that his opposition is still severely obstructing his policies through (ab-)use of the media. 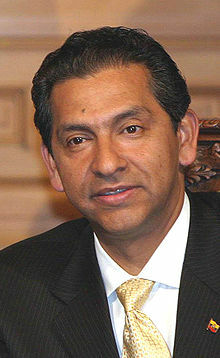 The 2010 coup attempt was denied by Correa's opposition at the time, but evidence that it was an attempt was presented rapidly: intercepted communications from within the police force indicating that destabilization efforts were being planned; an attack on Ecuador TV, former Ecuadoran president Lucio Gutiérrez calling on Correa to step down; 300 air-force troops were blocking the runway of Quito’s Mariscal Sucre International Airport and unfurled pre-printed banners; the president’s armored Nissan sport utility vehicle showed bullet damage including a shot to the windshield; professional coordination in organizing chaos in the country. The passing of a law affecting the police officers' bonuses and job benefits became a pretext for the rebellion which erupted in the capital city of Quito and the Guayquil seaport town. Actually, the law was not supposed to entail pay reductions, but those who masterminded the coup managed to convince the police that it would and thus provoked the uprising. These facts were downplayed in the Ecuador liberal press and surprisingly also in the mainstream US media. According to several International Press Associations and Human Rights Organizations throughout the year 2011 there has been a rapidly growing threat to freedom of expression in the country. Those organizations probably aren't aware where Ecuador is coming from. Ecuador has a history of popular uprisings, and has had eight presidents since 1996. Correa's government has been the most stable and successful one in more than a decade. Those organizations are probably also unaware of the true nature of Ecuadorian politics and its strong polarization. 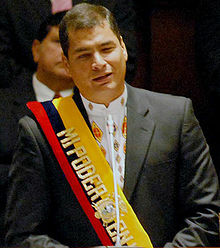 In May 2007 Correa filed a lawsuit against Francisco Vivanco Riofrío of the board of directors of the Quito-based La Hora newspaper over an editorial, titled “Official Vandalism,” said that Correa intended to rule Ecuador “with turmoil, rocks and sticks”. In the 6 February 2011 edition of El Universo a critical article was published "No a las mentiras" (No to lies) about a police uprising on 30 September 2010. President Correa filed a defamation complaint against the media company, three senior executives and the journalist Emilio Palacio. On 20 July 2011, all four defendants received three-year sentences for criminal defamation and were ordered to pay the president US$ 30 million in damages. El Universo was fined an additional US$10 million. The journalist Emilio Palacio is the half brother of former liberal President Alfredo Palacio (April 2005 to January 2007). Emilio Palacio has been ranting and raving Correa and his government for a long time in his El Universo columns. He is now living in Miami. In 2011 Correa has also filed a lawsuit against Juan Carlos Calderón and Christian Zurita , investigative journalists and authors of the book "Gran Hermano" (Big Brother). The lawsuit is based on the book's content, a journalistic investigation into contracts signed between the president's brother, Fabricio Correa, and the State. La Verdad editor Milton Chacaguasay Flores was jailed several times in 2008-09 for allegedly libeling a judge. A radio journalist was sentenced to one year in prison in May 2011 for supposedly defaming a local mayor. Frequent hostile speeches delivered by President Correa on TV and Radio against independent and critical media and the increase in cases of physical aggression against media employees has created a climate of growing fear and division amongst the Ecuadorian press. The government intends to establish a Regulatory Council empowered to regulate media content. five of its seven members will be chosen from institutions close to the government. The government plans to introduce a ban on privately owned news companies. One of the measures is that the owners of the “national” media may not have other businesses. Correa (as well as Chávez) revoked the license of Radio Caracas Televisión Internacional (RCTV Internacional) because he said its broadcast would be "coup instigating". In June 2009, fines were imposed on a remaining independent television station, Teleamazonas, for transmitting bull-fights and "The Simpsons" during prime time. In December 2009, the station was taken off the air under a provisional suspension of 72 hours. “All interviews with public officials are supposed to be cleared and monitored by the department of information...This has led many officials to stop giving information to the press, especially in corruption cases, because they are afraid," said Arturo Torres, the head of the investigative unit of Ecuador’s El Comercio newspaper, which has investigated numerous cases of corruption in the Correa administration.